[In the pipeline] [links] [Surf photos] [Tricks Page] [Orders + Questions]. 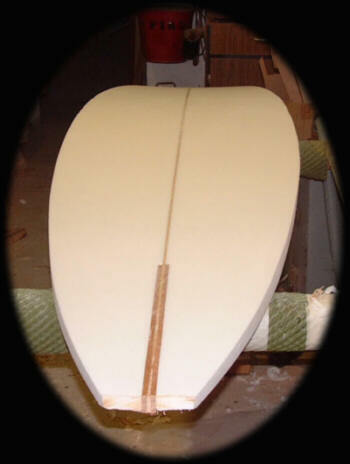 This section is just a guidline as to how I shape a surfboard, it has useful tips, as well as photographs for the first time surfboard shaper. This section should probably be used in conjunction with a book called "SURFBOARD" which is written in both English and Japanese! This book is available from most good surfshops and can probably be ordered through WH Smiths. To help, here is the ISBN number- " 0-912750-04-09 ". Squeege (used for spreading out the resin)- It is well worth investing a fiver on one of these, make sure it is white and "non-marking". Polish - I use "Farecla" as it is the polish a local fiberglass company use. - £15 for a tin would do about 7 or 8 boards, mabey more. Alternatives? umm, any sort of polish that is in the form of a paste (not a liquid) may do, mabey even toothpaste!! Also I always wear disposable gloves when glassing - £10 for a box of those gloves dentists use, also you can get those thin ones from the petrol stations. So you`ve worked out its going to cost you around £150 in total. Hey, its still quite cheap and you are getting top quality materials. Now before you go about making a shaping rack I think you need to get on with ordering the stuff as you can make the rack before it is delivered. 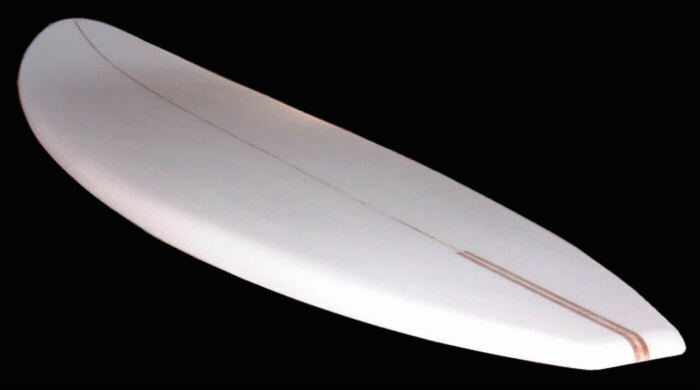 Remember that the choice of blank is one of the most important steps of making your surfboard. I get all my materials from the same company, called "Seabase" they are based in Newquay, Cornwall and they sell the blanks (made by "Clark Foam"), all the other materials and the masking tape and the squeege. On the links page you can see the "Clarkfoam" web address and you can contact them (and Seabase) from there. 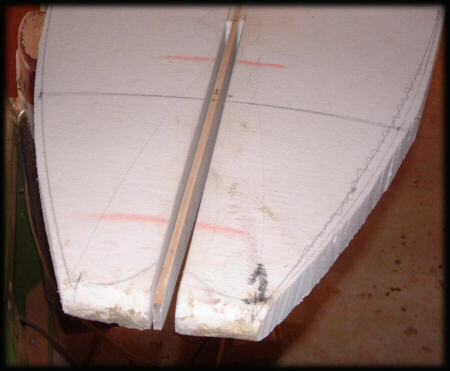 The only problem with this page is that I`ve never glassed on fins before, so I felt I can`t realy explain the procedure, however you can get the information for this on the other shaping website on my links page. Choose the blank very carefully. For my first board I copied all the dimentions off my friend`s board. Make sure that it is either the right dimentions or is a little bigger as you can take it down in size but you can`t add any on! Then get everything ordered and on its way. You can now set about making up a shaping rack. The proper shaping racks are a sort of "U" shape. 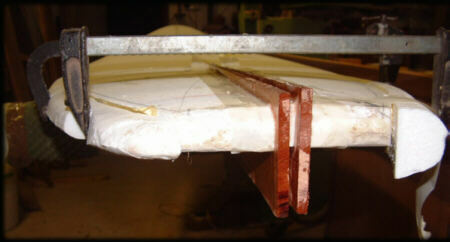 This allows the board to be laid down flat and on one side. 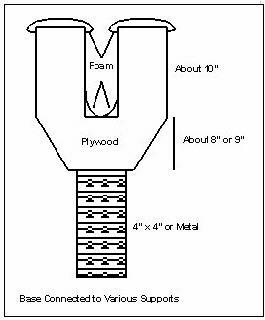 Here is a diagram of the standard shaping rack and next to it is my version. My rack is simply two 2" by 2" lengths of wood bolted onto the underside of the top of a chest of drawers and covered in carpet underlay. The main problem with my rack is that you can`t walk round the board so you have to turn the board round when you start the other side. 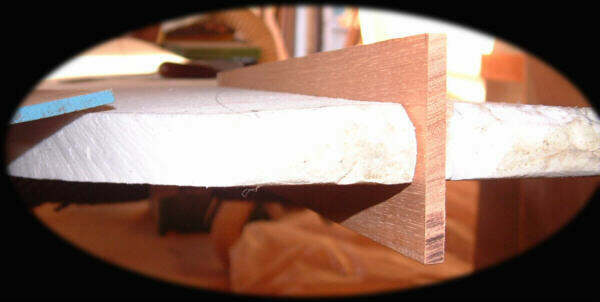 However any sturdy base for the board to lie on that is softly padded will be fine. 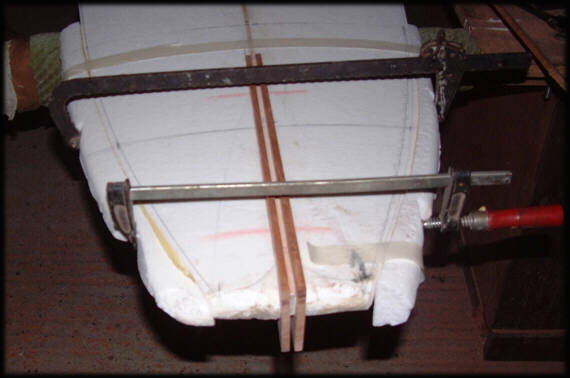 Remeber the blanks are extremely delicate so there can be no sharp parts to rack. The blank now arrives with all the other materials. Check that you have everything that you`re going to need (for example, once the catalyst was left out). Then at each of the sections copy the width of the original board (you may be just able to see the dark blobs near the end of each line in the above photograph). Here comes the tricky part where two people are required. You now have to "join the dots" on the blank using a spline (long (1m) bendy ruler, or use a long thin(equal thickness throughout) piece of wood). You have to join the dots with the spline while the other person draws the line. There you have the planshape ready to cut. Remember, it is important to do this, as just rounding the rails trying to avoid shaping the blank properly will result in an non-symetrical rubbish board. Seriously, take your time to do it right. A tip for marking the nose and tail is to make cardboard "half shapes" (as in only one half of the shape), and draw round these flipping the cardboard over to make the full shape of the nose/tail. This ensures both sides are exactly the same. Now double check that the marked out planshape look right. You`ll be surprised at how sensitive your eyes are to an imperfection, so if something looks wrong double check that you`ve marked the right width. Repeat the press-fit procedure for the other slot until both the pieces of wood slide in, and are quite snug, so that they won`t fall out of the slots. Now you have to prepare the board for the glue job. I always spend a lot of time on this, as a poorly prepared glue job can result in a panic (as the glue is setting) and a mess of resin drips everywhere. Right, the first thing you have to do is mask off the board very close to the area you are about to glue (I mask right to the edge of the slot) you must now be aware that any glue that sets on the board can only be chipped of resuting in a dent in the blank, that is why I glue the stringer thickener in before shaping the board. Once you have masked off the area, place the pieces of wood in the slots and clamp the board, as if it were the real glue job. To clamp it I use long clamps and the offcuts of foam to protect the board (see picture below-however see the next photo for the masking arrangement). When the resin is really tacky, but not quite set, peel off the masking tape. Now the fun begins, with a hand plane shape the wooden stinger thickener pieces down till they are are flush with the foam. Now you have to remove the layer or crust that is all over the board. To do this I use a hand-plane on a rough setting. 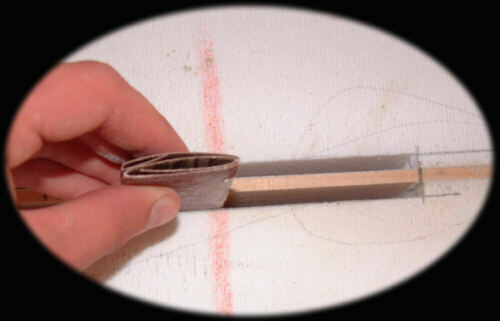 Once you have removed the crust on both sides of the blank, set your plane to a finer cut and continue shaping the board. Remember to keep your cuts quiet long and gentle. When you are happy with the deck and bottom shape you can now use a sanding block to get a better finish. I use a long (60cm by about 15cm and around 1cm thick) piece of wood with sand paper glued flat to it. Use it in a long sweeping motion so lumps or dips don't occur. 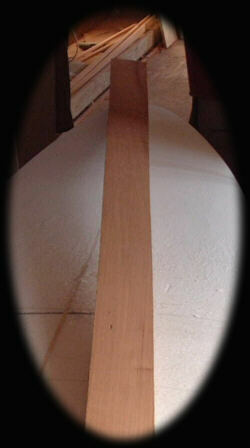 Once you are happy with the deck shape you are now (and only now) ready to start on the rails. 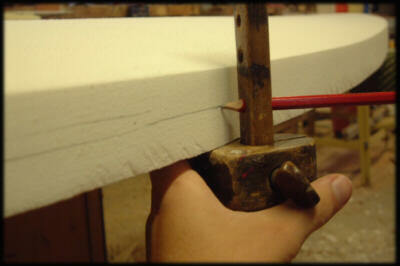 Shaping the rails; like in other stages of the shaping, proper marking out is essential. For this I use a marking gauge, but a pair or compasses will do the job. The most important thing here is to ensure both sides are the same. So whatever markings you make on one side, you must do the same to the other. Explaining how I mark out would be a difficult task, however I make a series of lines that I shape down to. Below is a photograph to show my lines, remeber the front of the board would typically have what are called 50/50 rails where the marking line would be half-way up the rail. At the centre it could possibly be 70/30 or "rolled" where the marking line would be drawn 70% from the top, 30% from the bottom. And for the last 1/3rd of the board length you normally have, "hard", "knife edge" rail edges where the rail is 100/0 so the deck is shaped right down to the bottom. If you are unsure just look at any board lying around and you should soon see what I mean. 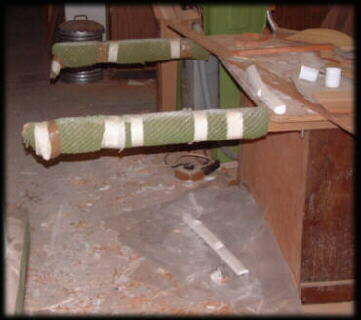 Below is a photograph to show typical markings I make on the rails. I can`t think of anything I have missed out. 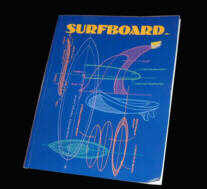 However use this in conjunction with other material (preferably the book "surfboard" (mentioned above)). If you have any problems during the shaping email me, or any other shaper really, nearlly all of the shapers I asked were really keen to help.